Devastation and barrenness all around, and all thanks to a fool with a spark. Our morning began with us getting our packs ready for a hike up Sasin Peak. We had been watching the weather reports all week and they showed a decent day for Saturday. That was of course until Saturday morning when suddenly a 40% chance of rain showed up. So annoying but we were still hopeful. Well as we drove along and got closer to the mountain the rains hit hard, so hard it was hard to see the road while driving! Not at all encouraging. We hoped it would be short lived and pass quickly while hiking and that the tree cover would keep us reasonably dry, so we drove on. We started up the Chehalis FSR and noticed a new water bottling plant being constructed just in from the start of the road. Further on we caught up with a truck hauling in a heavy excavator. 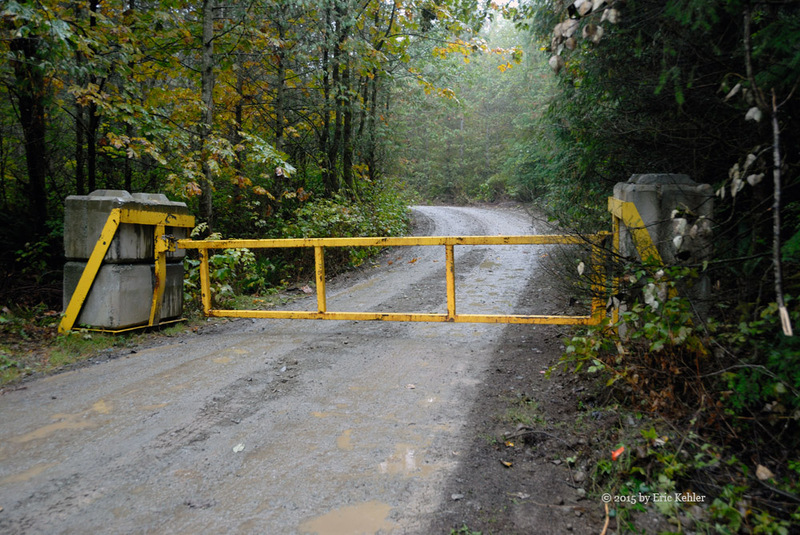 Finally we reached our side road up the Pretty Creek area and there we spotted a new locked gate! It wasn’t on my road report but still, it was in our way. If the rain was annoying, this was very irritating. The light rain falling as we approached the gate added to our mood and so we had to cancel our hike and plan something else. After a brief discussion we decided to backtrack and leave the Chehalis and drive to the Sts’ailes for the day. I had wanted to explore the area burned in the Wood Lake fire and today was convenient with our hike canceled. 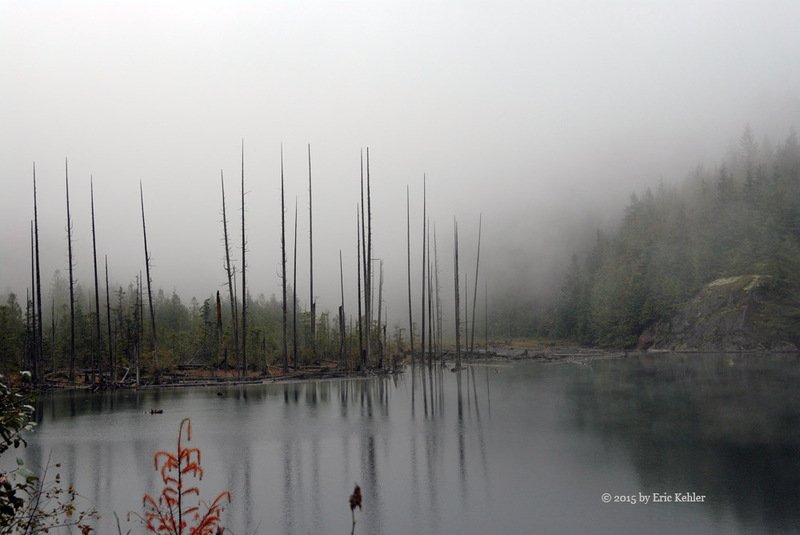 So after a brief stop at Elbow Lake for a few photos of the mist on the lake we set off for the Harrison area. We made good time and soon were driving along the first section of the FSR. There is a small lake quite close to Wood Lake which has a small cabin on it and we were wondering if it was still there. The area looked much as always as we drove north and it wasn’t until just before Wood Lake that signs of the forest fire could be seen. We found the side road to the cabin and drove up it, the area looked green and burn free so we were feeling fairly comfortable that all would be well at the small lake. When we arrived at the wide camping spot looking down on the water we could see the cabin through the trees, it was in fine shape and was not touched by the fire. After short visit we returned to the mainline and continued up to Wood Lake where we finally saw the start of the badly burnt area. 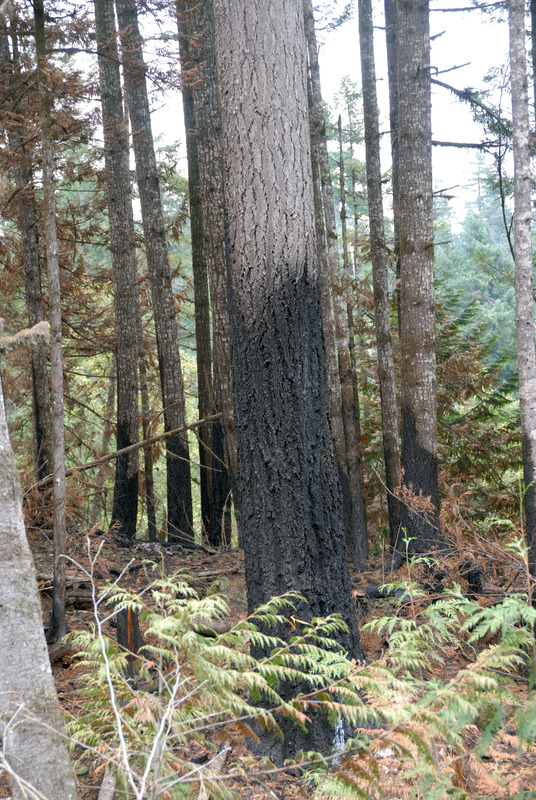 Fortunately the area around the lake and the camp ground had only the underbrush burned, the trees were still standing and green. It looks like in a year or two it will look fairly reasonable for a camping spot. Continuing past the lake we encountered the first area that was burned to the ground. 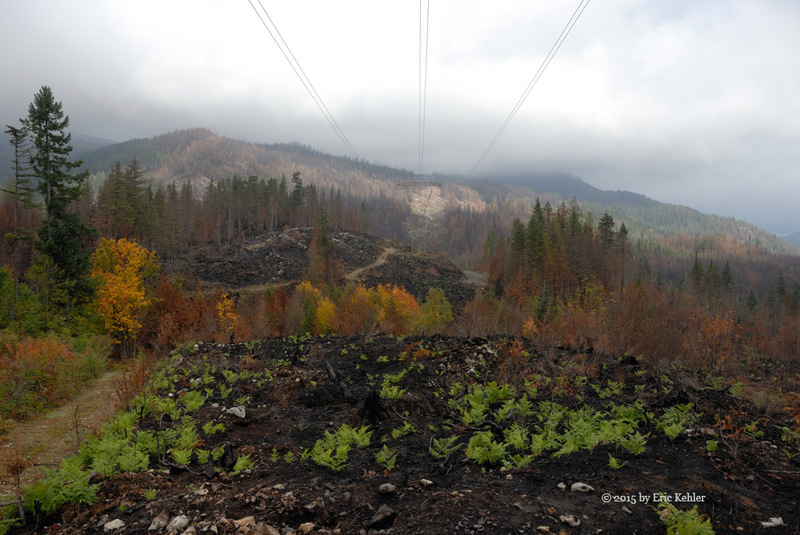 The trees were gone, all green was missing, just charred ground. The rock face of the cliffs were very odd to look at. Previously they were mostly hidden but what could been seen was covered in moss, today the rocks were fully exposed and crisscrossed by black soot from the moss. They rocks looked so stark without the moss giving it life. This starkness continued for miles. We stopped at one spot where we had a view across the valleys, we saw that the fire had burned one spot to the ground , another the trees were dead and brown but still standing, and a third area had the ground cover burned and the trunks blackened but the trees were still green. Amazingly across the open charred expanse ferns were popping up all over bringing back the greenness of life to the dead valley. We continued along the road a bit further only to spot two bear cubs playing on the side of the road. They quickly descended into the bush as we approached. We never did see their mother. Our next stop was to look over the start of the Hale Peak hiking trail which goes to the fire lookout on its summit. I had hiked this trail earlier this year and I wanted to see how it survived the fire. I hope the fire lookout building on the summit was saved, I understood that it was a priority but one never knows. As we neared the start of the trail we were struck by how open the area was now. The side of the mountain was exposed burnt rock and the first section of the trail was now fully open and not hidden by trees. I could see that though trees were standing along the trail further in, the ground was burnt, hopefully the trees were not too damaged and will survive. It was a sad view. We continued further north and descended to the Mystery Creek fork, by here the area was back to normal as the fire hadn’t reached this far north. We decided to explore the road where we had been stopped due to a beaver dam earlier this year. On our last trip the road had been opened but we didn’t have time to explore the area. 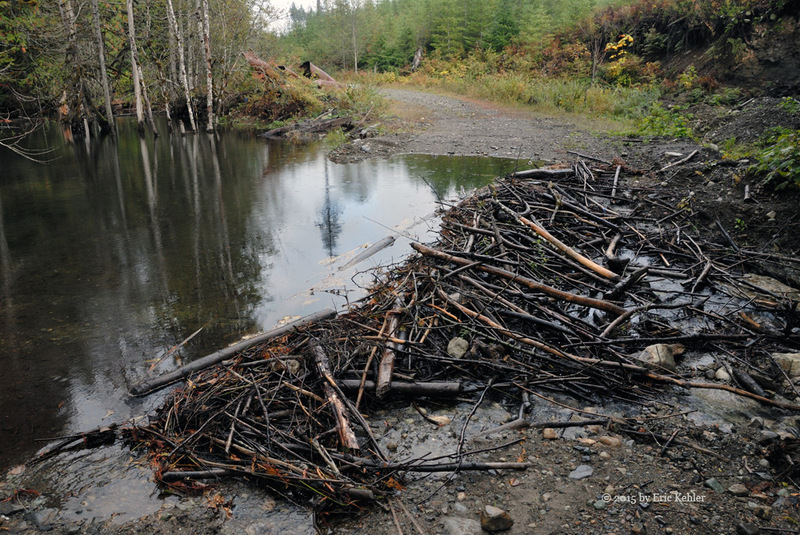 When we arrived at the spot of the beaver dam we were greeted with, well I am sure you can guess – a new beaver dam. The dam had backed up the water deep enough that we ddidn’t feel comfortable crossing. We decided enough is enough and we set about to clear enough of the dam that we could lower the water level enough to cross. We pulled out a section and after around 45 minutes the water had dropped 8+ inches and we were willing to try a crossing. It went OK and now we could explore the road. The road led up the slope for some distance and we had a few good view of Harrison Lake before the road led into the upper valley and trees. We eventually had to stop as the road was over-grown and we didn’t want to push on. It took some serious maneuvering to turn around but soon we were heading down and looking for a spot to eat some lunch. We took the only fork we came by this side of the beaver dam and stopped where we had a nice lake view. The rain had started up again and as Geoff had to cook his meal, we needed a shelter to hide under while he heated his food. 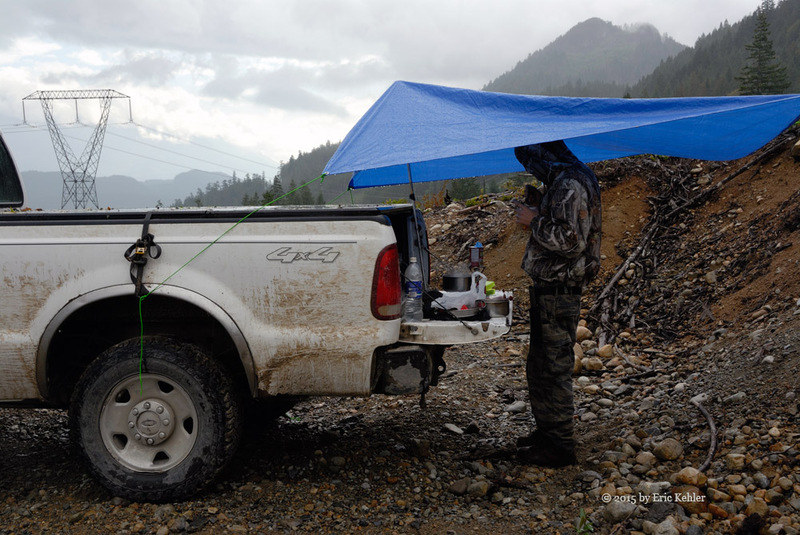 Fortunately I had my small tarp for hiking and we set it up and cooked under it. By the time we were done eating the rain had passed and the skies were clearing. We continued north and eventually came to rest at the Bremner Creek camp site that we enjoy visiting. This is the spot we launched our canoe from earlier this year when we were looking for the Petroglyphs. The place was empty and we had a nice opportunity to look around and take a few photos. It was now getting later in the day so we decided to turn around and start for home. As we drove the road north earlier we spotted a construction campsite just below the road near Westwood Bay, so on our way back we decided to see what it is about. We think that this camp will be for workers building the power line under the lake for the Big Silver Creek power project on the east side. It was empty while we were there but I’m sure it will be filled soon. We left Westwood Bay and set off for home as we were both feeling tired from a day of bouncing around gravel roads. So even without the planned hike, we saw some interesting sights around the Fire and just enjoyed a day in the fresh air.